I absolutely adore Nigel Slater and when I came across his Tender series I just couldn’t resist buying Volume One (Volume Two is on my birthday wishlist!) I am so glad I did and I fully recommend it to everyone who grows their own vegetables! It’s such a beautiful book and the photography is amazing, there’s also handy notes on each vegetable including how to grow it, varieties, seasoning etc too. However, one recipe in particular stood out from the crowd, it had simple instructions and yummy ingredients, plus the photograph looked delicious as well. We happened to have one butternut squash left in our winter store so I decided to use it in this recipe, although next year I think we are going to have to grow more just to make this dish with! 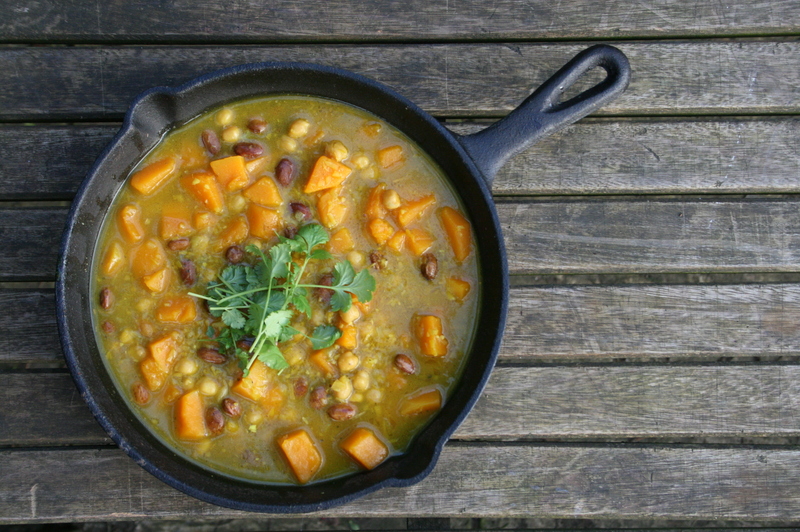 The recipe is called ‘Chickpeas with pumpkin, lemongrass and coriander’, although we didn’t have any pumpkin and I added in some homegrown dried borlotti beans too, therefore I have changed the name to ‘Butternut Squash and Bean Curry’! Drain the chickpeas and borlotti beans and bring them both to a boil in deep, unsalted water. Let them simmer for 45 minutes until tender. Peel the onions and chop them finely. Pour some oil into a deep casserole pan and add the onions, letting them cook over a medium heat until soft and translucent. Peel the garlic and ginger, remove any tough leaves from the lemongrass then make into a rough paste using a food processor. Stir the mixture into the softened onion and continue to cook. Add the ground coriander and tumeric, then lightly crush the seeds of the cardamom pods before stirring them in. Keep the heat fairly low and don’t let the ingredients brown. 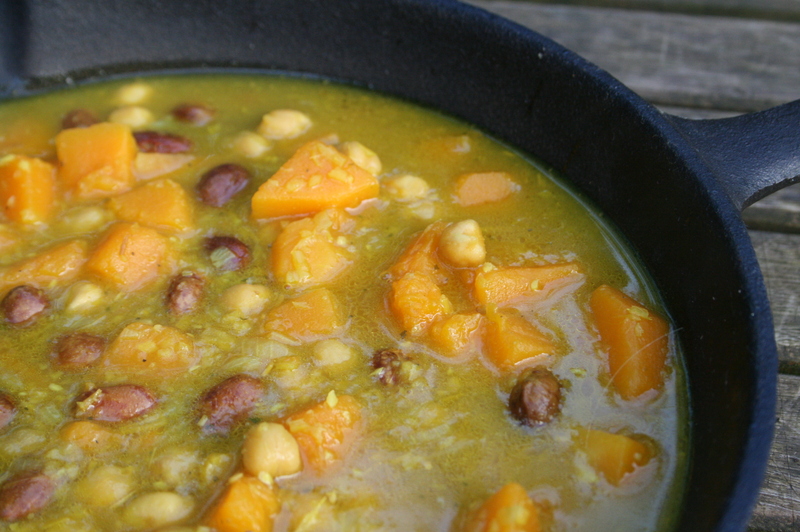 Chop the squash into large chunks (no larger than you would like to put in your mouth) then add to the pan along with your drained chickpeas, borlotti beans and the stock. Bring to the boil, then turn down to a simmer and continue to cook at a gentle bubble until the squash is tender. Stop as soon as the flesh is yielding to the point of a knife, you don’t want it to collapse. Stir in the coconut milk and continue to simmer. Serve with basmati rice and some naan bread. I have a new love for curry “anything” ! This sounds so delicious, I just may make this tomorrow. I’m going thru your older posts that I may have missed. This post was from April and its July 23rd , and you’re probly somewhere in Wales right now, but a good recipe needs recognition! A trip to my fave store for butternut squash is in order! Weird part is, I already have all other ingredients! Did I say I love curry? Anyhoo, enjoy vaca (holiday).